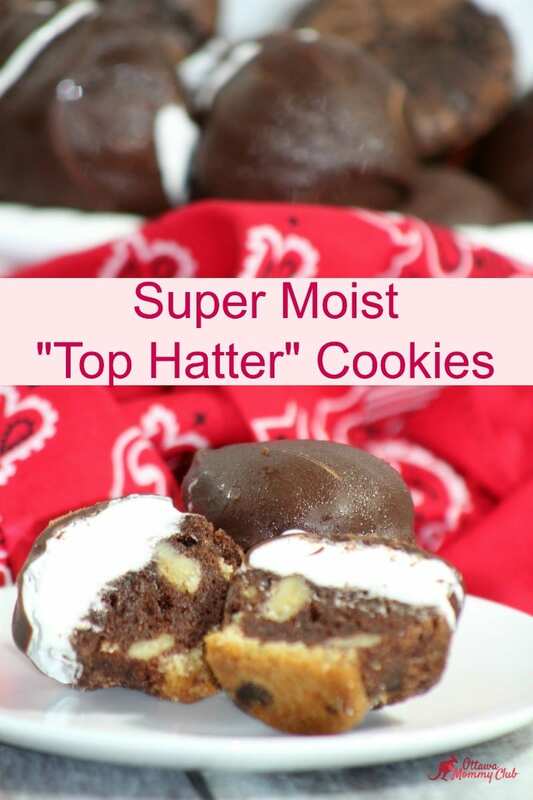 Just in time for the release of the new movie, Alice Through the Looking Glass, these “Top Hatter” cookies will be a big hit with your family. The cookie has chocolate chips at the bottom, a brownie, and then topped with marshmallow and dipped in chocolate. Yummy! -Make brownies as per box directions. -Line a mini cupcake tin with paper liners. -Mash a small section of the chocolate chip cookie dough into the bottom of the lined cupcake tins. -Using a large spoon, spoon the prepared brownie mix into the lined cupcake tin almost to the top of the cupcake liner. -Bake at 350 degrees for 15 minutes or until a toothpick inserted in the center comes out clean. -In a heat proof bowl combine all of the above ingredients…egg whites, water, sugar, and cream of tartar. -Use a hand mixer, beat the ingredients until foamy (1-2 minutes). -Sit the bowl in a smaller pot without the bowl actually touching the simmering water. -Continue to mix the frosting for 12 minutes. -Beat until stiff peaks form. -If you are using a candy thermometer the frosting should read 160 degrees. -Remove bowl from the simmering water and continue to mix for an additional 2 minutes. -The frosting should now appear to be thick and creamy, similar to a jar of Fluff. -Divide the frosting in the bowl into 2 separate bowls. -Add 1 bowl of frosting into a pastry bag with a #12 frosting tip. -Using the pastry bag and tip frost your Top Hat Bites. -Put the Top Hat Bites in the freezer for a minimum of 15 minutes. -Put the chocolate pieces into a bowl with the vegetable oil. -Melt the chocolate in a microwave for 20 seconds. -If not melted, continue to heat in the microwave for an additional 20 seconds. -Continue for additional 20 seconds until the chocolate is thoroughly melted. -Once the chocolate is melted, dip the top hats into the melted chocolate until covered. Make brownies as per box directions. Mash a small section of the chocolate chip cookie dough into the bottom of the lined cupcake tins. Using a large spoon, spoon the prepared brownie mix into the lined cupcake tin almost to the top of the cupcake liner. Bake at 350 degrees for 15 minutes or until a toothpick inserted in the center comes out clean. In a heat proof bowl combine all of the above ingredients…egg whites, water, sugar, and cream of tartar. Use a hand mixer, beat the ingredients until foamy (1-2 minutes). Sit the bowl in a smaller pot without the bowl actually touching the simmering water. Continue to mix the frosting for 12 minutes. If you are using a candy thermometer the frosting should read 160 degrees. Remove bowl from the simmering water and continue to mix for an additional 2 minutes. The frosting should now appear to be thick and creamy….similar to a jar of Fluff. Divide the frosting in the bowl into 2 separate bowls. Add 1 bowl of frosting into a pastry bag with a #12 frosting tip. Using the pastry bag and tip frost your Top Hat Bites. Put the Top Hat Bites in the freezer for a minimum of 15 minutes. Put the chocolate pieces into a bowl with the vegetable oil. Melt the chocolate in a microwave for 20 seconds. If not melted, continue to heat in the microwave for an additional 20 seconds. Continue for additional 20 seconds until the chocolate is thoroughly melted. Once the chocolate is melted, dip the top hats into the melted chocolate until covered. These are very interesting and something different to make, the grandkids would love them, seem to have quite a few steps to make, but I’m sure it’s all worth it!! They look amazing! Yum! It looks little complicated to make. Thank you for sharing the recipe! wow what a decadent looking treat! Would be great wth a big glass of milk sitting by the fire! Let us know how you like it Kristen! Thanks for commenting! with hardly any ingredients or steps!! These definitely sound like they would be worth the effort to make! These sound super delicious! Gotta try them for sure. Oh, these would be a huge hit with my family! What a unique recipe! Thanks! Oh these sound really good, I am definitely going to have to make these! Thanks for the recipe! You are welcome and let us know how you liked them! Thank you for sharing this recipe these cookies look so delicious. You had me at Ooey Gooey!I think they look delicious and going to give them a try.I hope they turn out as good as yours look. Those look so good and I could use some cookies right now. These are brownies with a new twist.They look marvelous and easy to make.Thanks for the great recipe. This recipe has a lot of steps but the rewards are delicious I bet.